Dancing devils, towering skeletons, and altars festooned with marigolds made their way down Mexico City’s main thoroughfare on Saturday to commemorate Day of the Dead in a country still mourning nearly 500 people killed in earthquakes last month. More than 700 performers prepared for months for the colorful afternoon procession along more than 4 miles (7 km) of the expansive Paseo de la Reforma Avenue. The two 8.2 and 7.1 destructive earthquakes in September prompted some late changes to the program. A raised fist constructed out of hard hats and pick-axes led the way in the parade, greeted by cheers and applause from thousands of onlookers. Just behind, a group in fluorescent aid-worker vests marched with fists in the air - a tribute to the rescuers who made the gesture to demand silence as they listened for survivors in the rubble from the second quake, on Sept. 19, which toppled dozens of buildings and killed nearly 230 people in the capital. But the strongest earthquakes in more than three decades did not diminish a centuries-old Mexican celebration. Participants and onlookers alike painted their faces as colorful skulls, many in the style of Mexico’s iconic skeleton figure known as La Catrina. “For us a, a society it was something very violent that moved our conscience,” said Ramon Marquez, 51, wearing an orange t-shirt emblazoned with the phrase #fuerzamorelos (Be strong Morelos) referring to one of the areas affected by the quake. “The parade could be a distraction, a way of escaping.” “We’re not only here to celebrate and dance, but also when there’s a disastrous situation we come together to help,” Violeta Canella Juárez, 31, said. This year's edition featured dance and fashion depictions of Pre-Hispanic, Colonial and Revolutionary Mexico, as well as homages to late political cartoonist Rius, cinema golden age diva María Félix, among others. The parade concluded with mariachi musicians belting out Mexican folk songs from a float covered with flowers and colored paper like the boats that cruise the canals in the south of the city. 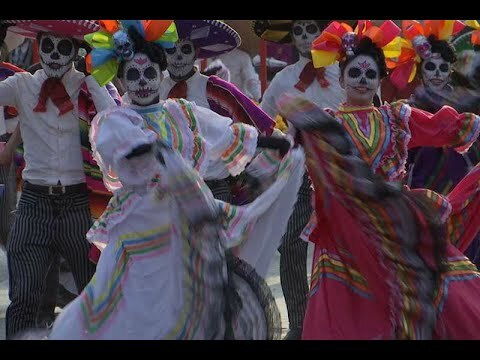 Women dressed in wedding gowns - catrinas- danced with their grooms-catrines-, both with faces painted as skulls.